Dr Jacques Leider (far right) in discussion at the Ministry of Defence’s Historical Museum in September 2017. Dr Jacques Leider is reputed for his denial of Rohingya identity, their unique history, and the crime of genocide the group has been subjected to for decades. 28 Mar 2018 – Slowly but surely the world is coming to terms with the gruesome reality of Burma’s genocide of the Rohingyas. As early as 2015 London Queen Mary College’s State Crimes Initiative alerted the international community of the ongoing genocide in Arakan. Hardly anyone paid heed to that ominous warning. Eventually, as the situation in Arakan took a turn for the worse, taking a heavy toll on Rohingya lives, livelihood and liberty, the progressive elements among the international community acknowledged the unpalatable reality. The People’s Tribunal on State Crimes of Myanmar, in two subsequent sittings in March and September 2017 in London and Kuala Lumpur respectively, unequivocally termed the atrocities committed by the Burmese government as “genocide”. The UN special rapporteur on human rights situation of the country has clearly stated that such actions bear the “hallmarks of genocide”. Without mincing his words, the French President Macron has expressed his disgust of Myanmar’s genocide. Even the unpredictable British Foreign Secretary termed it as “industrial scale ethnic cleansing”. The Holocaust Museum acknowledged it as a genocide and expressed solidarity with the victims. Nobel laureates Bishop Tutu and Amartya Sen have labelled it as “slow burning genocide” while the Rohingya diaspora moved the High Court of Australia demanding that visiting State Counsellor of Myanmar Suu Kyi be arrested for crimes against humanity. Despite this growing trend guided by corporate, military-industrial and strategic interests, many powerful states vie with one another in placating the murderous Burmese authorities, shunning their obligations under international human rights law. Some among those attempt to draw a distinction between the erstwhile icon of freedom, State Counsellor Suu Kyi and the military; though over time actions and statements of the former have rendered such distinction increasingly untenable. As horrendous narratives of survivors and images of Burmese genocide began to secure space in the global print and electronic media and in the reports of reputed institutions, the lies meted out by the Burmese authorities have been gradually exposed. Satellite imagery and uncovering of mass graves further vindicated the scale of their barbarity. As an integral component of the genocidal act, the military governments of Burma over the last four decades have launched a campaign denying the ethnic Rohingya identity to the community. The policy is being pursued in full steam under State Counsellor Suu Kyi’s government. The central theme of the campaign has been to deny the legitimacy of the Rohingya claim as an ethnic community and to present the community members as recent illegal entrants from neighbouring densely populated Bangladesh, conveniently labelling them as Islamic terrorists. The official narrative, though spuriously grounded, is being assiduously pushed forward by the Burmese government. Over the decades the Burmese political-military establishment has been largely successful in incorporating the revisionist history in the country’s academic curricula that celebrate the supremacy of Buddhist-Bhama nationalism and relegate other ethnic groups. In this specious discourse the Rohingya identity has been completely obliterated. Thus generations of Burmese have identified Rohingyas as undesirable Muslim foreigners in the pristine Buddhist land and had no problem in terming them as “kalars” or “Bangalis”. In this official discourse Buddhist Rakhines are presented as indigenous, and Rohingyas as illegal aliens. Over the last few months a storm has been brewing in the academic circles as the prestigious University of Oxford decided to appoint a French academic Jacques Leider to author a reference article on “Rohingya: Emergence and Vicissitudes of a Communal Muslim Identity in Myanmar” for Oxford University Press’s (OUP) Oxford Research Encyclopedias: Asian History series. Dr Jacques Leider is a well-known adviser to the Burmese military including that of the Armed Forces Historical Museum in Naypyidaw and reputed for his denial of Rohingya identity, their unique history, and the crime of genocide the group has been subjected to for decades. Speaking on public events in Burma, including those sponsored by the Burmese military, Leider is on record reiterating his position that Rakhine identity is a “real ethnic identity”, whereas the Rohingya group identity is an “invented political identity”, created by politically motivated Muslims in the 1950s, in spite of all historical and official records to the contrary. The Rohingya community, particularly those in the disapora, was baffled at the selection of Leider as an “authority” on their community. For the Rohingya community, Leider writing the piece would constitute “a classic colonial act”, a racist White Man disliked by the subject is commissioned to put together a piece about the subject people, despite the latter’s rejection of him as “an expert” on their affairs, including their identity and history. They find the decision of the Oxford University Press as “adding insult to their injury”. Eighty academics from different parts of the world, including two Emeritus Professors of Oxford University, Barbara Harriss-White and Barbara Harrell-Bond, Princeton University Professor Richard Falk, MIT Professor and linguist Noam Chomsky, Columbia Professor Gayatri Spivak, eminent peace scholar Johan Galtung, Queen Mary University of London Professor Penny Green, genocide scholar Gregory Stanton and founding editor of the journal The Holocaust in History and Memory Rainer Schulze, have called upon the Vice Chancellor of the University of Oxford to desist from commissioning Leider with the task. Their concern was a publication of the reputed university will inflict long-term damage as it will misinform a new generation of students of history and identity. As Rohingya scholar Maung Zarni cogently reminds, “A single racist choice of not recording Rohingyas in the colonial censuses has been used by the genocidal governments and apologists as the basis for exclusion and disenfranchisement of Rohingyas as a group. It was an arbitrary choice out of administrative expedience for taxation and population control on the part of the colonial administrators in Burma, but one with deep and dark consequences”. 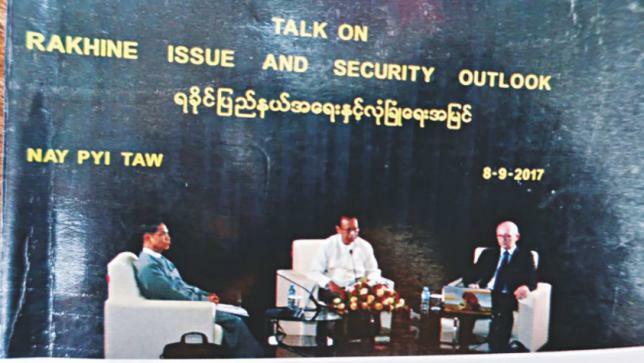 Further evidence of Leider’s collusion with the Burmese establishment are his attempts to disparage and derail the Berlin Conference on Myanmar Genocide held last month by manipulating the sensitivity around Shoah (Nazi Genocide of the Jews). Leider portrayed Columbia University Professor Gayatri Spivak, the keynote speaker of the Conference and an ardent champion of the Rohingya cause, as “anti-Semitic”. Spivak has been long known for her “boycott Israel” campaign. In its much delayed response to another group of concerned East Oxford residents, the Oxford University Press noted that “The history of the Rohingya is a complex and contentious area of research and, as always, the Press’s goal is to represent this history with accuracy, balance, and sensitivity.” OUP defended its editorial board’s decision saying that Dr Jacques Leider was selected for his “subject-matter expertise”. It went to claim that the “decision on whether to accept his article for publication will be informed principally by the outcome of an external peer review exercise and the scholarly assessment of the Press’s editorial board, which is composed of career historians of Asia”. The OUP’s defence that its strict refereeing process would ensure fairness and accuracy is not acceptable. Critics have noted that the fact that only Rohingya communalism was made the focus of the article suggests that there is at least a tacit acceptance of the opposing Rakhine community’s claim of its own authenticity as an ethnic group. Quite justifiably a case can be made that for all fairness a similar piece examining Rakhine Buddhist communalism be commissioned and published simultaneously with the piece on the Rohingya. That call also went unheeded. One surely has reason to feel disturbed at the OUP’s selection of the expert who is still hooked on to the binary of “real ethnicity” and “political ethnicity” at a time when Benedict Anderson’s seminal work Imagined Communities: Reflections on the Origin and Spread of Nationalism (1983) clearly posits that nations, national sentiments and national identities are all products of collective imaginations. It is interesting to note that thus far OUP has not approached perhaps the most authoritative scholar on the subject matter, Michael Charney of the School of Oriental and African Studies (SOAS) to review Leider’s submission. His University of Michigan doctoral thesis (1999) focused on religious communalism in Rakhine through the colonial period. Charney has sustained his engagement on the issue till this day, and drawing evidence from historical sources maintains that “No group in Arakan would pass the test of ‘indigenous’”. As the deadline for the publication of the volume looms large, there is little indication that Oxford University authorities have paid attention to the concerns expressed. It is unfortunate that an institution reputed for its academic excellence and deemed as a source of new knowledge “based on facts, accuracy and fairness” has remained adamant on its imprudent decision. CR Abrar teaches international relations at the University of Dhaka and was a signatory of the letter to the Vice Chancellor of the University of Oxford. He would like to acknowledge the insights gained from discussions with Burmese dissident scholar Maung Zarni.